Natina Reed, a member of the US R&B trio Blaque who played a cheerleader in the 2000 film Bring It On, has died in Georgia, police have confirmed. Reed was struck and killed by a car on Friday night, two days before what would have been her 33rd birthday. Blaque released a number of successful singles in the late 1990s that included 808, I Do and Bring It All To Me. In a statement, her bandmates Brandi Williams and Shamari Fears-DeVoe said they were "devastated" by the news. "Natina continuously embodied the pioneering spirit of Blaque and her undeniable creativity touched the hearts of fans everywhere," they continued. "Natina was a mother, sister, accomplished songwriter, artist and friend. "She will forever be missed and her global influence eternally felt." Proteges of the late TLC rapper Lisa "Left Eye" Lopes, Blaque took their acronymic name from the words Believing, Life, Achieving, Quest, Unity and Everything. The trio appeared together in the cheerleading film Bring It On as members of the East Compton Clovers troupe led by Gabrielle Union's character Isis. 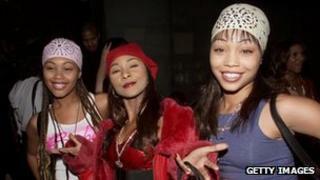 Blaque's biggest UK success came in 2004 when their single I'm Good, featured in the dance film Honey, reached 17 in the official singles chart. Reed was engaged in 2001 to the rapper Ricardo Brown, better known as Kurupt, and is survived by their 10-year-old son Tren. Authorities in Georgia have ruled that the driver who struck Reed was not at fault and that no charges are expected to be filed.